I adore Thee O Glorious Cross which was adorned with the Heart and the Body of my Saviour, Jesus Christ, stained and covered with His Precious Blood. I adore Thee O Holy Cross out of love for He Who is my Saviour and my God. Pope St. Pius IX declared that reciting this prayer 5 times on Friday will free 5 souls from Purgatory, and 33 souls by reciting it on Good Friday. This prayer should be recited before a crucifix with a contrite heart, and praying a few moments for the Holy Souls in Purgatory. 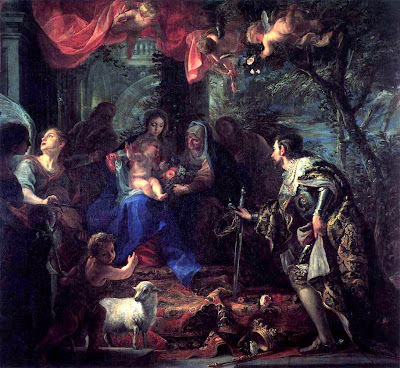 St Louis IX paying homage to the Infant Jesus by offering Him his crown and sword. Look upon us from Heaven, O Holy Monarch! And in this eternal happiness you possess, be sensitive to our miseries; unworthy that we are of your help, do not refuse us. Look favourably on this kingdom which you governed so wisely, and loved so tenderly. If, by the corruption of vices which have been introduced after your reign, the face of France appears disfigured to you, let that itself be a motive for your interest, as her king, in renewing her. If there you see scandals, help us to remove them. Above all, extend your protection to our august monarch. He is your son, the head of your house, the imitation of your virtues, the vivid image of your heroic and royal qualities: for he is, like you, the Zeal of God; he is, like you, the protector of the True Religion; the restorer of the altars; the exterminator of heresy. Obtain for him the graces and the understanding which he needs in order to achieve the great designs with which God inspires him. May this spirit of holiness which has directed you in all your ways come to rest upon him, that he animate us, and conduct us all to a blissful eternity. Through Jesus Christ, our Lord. Amen. R. That we become worthy of the promises of our Lord Jesus Christ. O God, who hast transferred Thy confessor Saint Louis from an earthly kingdom to the glory of Heaven, make us, by his merits and his intercession, participants of the happiness of the King of kings, Jesus Christ, Thy Son, our Lord, who lives and reigns with Thee in the unity of the Holy Ghost, forever and ever. Amen. Saint Cyprian is a Doctor of Holy Mother Church. He was Bishop of Hippo. The following is from a sermon on the words of the Our Father prayer, written in 252 A.D.
“In the next part of the prayer, Our Lord reminds us that it is necessary for us to say: ‘And suffer us not to be led into temptation.’ By these words, we are indoctrinated with the fact that our adversary the devil can do nothing against us unless God gives him permission beforehand. From this it follows that all our fears, our supplications and our devotions should be centred on God, since in all temptations with which the devil assails us, he has no more strength than that precise degree which God permits to him. “This is a truth which Scripture proves, when we read: ‘Nabuchodonosor, king of Babylon, came to Jerusalem and besieged it.’ And the Lord delivered it into his hands (cf Dan. 1:1-2). Power is given to the devil according to the measure of the sins we have committed, as it is written: ‘Who hath given Jacob for a spoil, and Israel to robbers? Hath not the Lord Himself, against whom we have sinned? And they would not walk in His ways, and they have not harkened to His law. And He hath poured out upon him the indignation of His fury’ (Isa. 42: 24-25). And in the same connection, we read of Solomon, when he was going from sin to sin and withdrawing his obedience from God’s commandments and from the ordinances of the Creator: ‘And the Lord raised up an adversary to Solomon’ (3 Kings 11:14). “Power is allowed our adversary in his battle against us for a twofold reason: first as a penalty when we sin; and second as an augmentation of our glory when we remain steadfast. We observe this fact in the case of Job, of whom God spoke quite plainly saying: ‘Behold, all that he hath is in thy hand; only put not forth thy hand upon his person’ (Job 1:12). And in His Gospel, during the ordeal of His Passion, our Lord says: ‘Thou wouldst have no power at all over Me were it not given thee from above’ (Jn 19:11). [Source: pages 71-74, St. Cyprian's Explanation of the Our Father, translated by Fr. W. Patrick Donnelly, S.J., Imprimatur: January 29, 1953, published by Refuge of Sinners Publishing]. The holy souls in Purgatory intercede for us, but cannot help themselves! “Thus far we have spoken of the different kinds of good works which we may offer to God as suffrages for the dead. It remains for us to make known an act which comprises all works and means, whereby we can most effectually assist the poor souls; it is the heroic vow, or, as others call it, the Heroic Act of Charity towards the souls in Purgatory. “This act consists in ceding [giving] to them all our works of satisfaction, that is to say, the satisfactory value of all the works of our life and of all the suffrages which shall be given to us after our death, without reserving anything wherewith to discharge our own debts. We deposit them in the hands of the Blessed Virgin, that she may distribute them, according to her good pleasure, to those souls which she desires to deliver from Purgatory. “It is an absolute donation in favor of the souls of all that we can give them; we offer to God in their behalf all the good that we do, of what kind soever, either in thought, words or works, all that we suffer meritoriously during this life, without excepting anything that we may reasonably give them, and adding even those suffrages which we may receive for ourselves after death. “It must be well understood that the matter of this holy donation is the satisfactory value of our works (see Chap. 9), and in no way the merit which has a corresponding degree of glory in Heaven; for merit is strictly personal, and cannot be transferred to another. “The Sovereign Pontiffs, Benedict XIII, Pius VI, and Pius IX have approved this heroic act, and have enriched it with indulgences and privileges, of which the principal are the following: 1. To priests who have made this act the indult of a privileged altar every day in the year. 2. 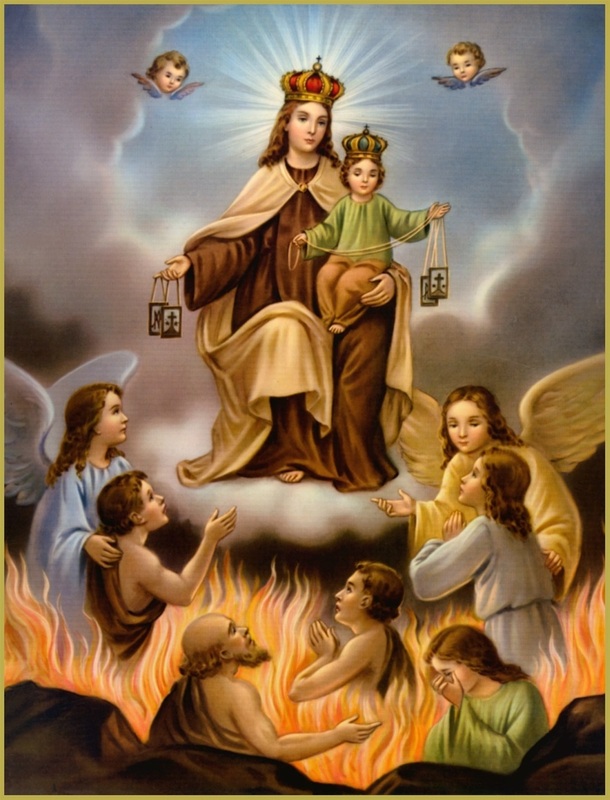 The simple faithful can gain a plenary indulgence, applicable to the holy souls in Purgatory only. 3. They may apply to the holy souls all those indulgences which are not otherwise applicable by virtue of concession, and which have been granted up to the present time, or which shall be granted in the future. (Pius IX, Decr. 30 Sept. 1852). These words express the precious advantages of the Heroic Act; and in order to dissipate all subsequent fear which might arise in the mind, we add three remarks: 1. This act leaves us perfect liberty to pray for those souls in whom we are most interested; the application of these prayers is subject to the disposition of the adorable will of God, which is always infinitely perfect and infinitely loving. 2. It does not oblige under pain of mortal sin, and can at any time be revoked. It may be made without using any particular formula; it suffices to have the intention, and to make it from the heart. Nevertheless it is useful to recite the formula of offering from time to time, in order to stimulate our zeal for the relief of the holy souls by prayer, penance, and good works. 3. The Heroic Act does not subject us to the direful consequences of having to undergo a long Purgatory ourselves; on the contrary, it allows us to rely with more assured confidence on the mercy of God in our regard, as is shown by the example of St. Gertrude. [Source, pp. 264-268, Second Part, Chapter 31, Purgatory: Explained by the Lives and Legends of the Saints, by Fr. F. X. Schouppe, S. J., Imprimatur October 11, 1893]. Jesus, Mary, Joseph, I give Thee my heart and my soul. Jesus, Mary, Joseph, assist me in my last agony. Jesus, Mary, Joseph, may I breathe forth my soul in peace with Thee. [Source: p. 168, from the 1910 Raccolta;300 days TQ, 100 days indulgence, Pope Pius VII, April 28, 1807 ]. Mercy of our God, encompass us, and deliver us from every plague. Gloria Patri et Filio et Spiritui Sancto. Amen. Eternal Father, sign us with the Blood of the Immaculate Lamb, as Thou didst sign the dwellings of Thy people. Gloria Patri et Filio et Spiritui Sancto, sicut erat in principio, et nunc, et semper, et in saecula saeculorum. Amen. Most Precious Blood of Jesus our Love, cry for mercy for us from Thy Divine Father, and deliver us. Gloria Patri et Filio et Spiritui Sancto, sicut erat in principio, et nunc, et semper, et in saecula saeculorum. Amen. Wounds of my Jesus, mouths of love and mercy, speak for us in pity to the Eternal Father; hide us within yourselves and deliver us. Gloria Patri et Filio et Spiritui Sancto, sicut erat in principio, et nunc, et semper, et in saecula saeculorum. Amen. Eternal Father, Jesus is ours; ours His Blood, ours His infinite merits; to Thee we offer ourselves wholly; then, if Thou lovest Him, and boldest [think] precious this gift we make Thee, Thou oughtest to deliver us: for this we hope with fullest confidence. Gloria Patri et Filio et Spiritui Sancto, sicut erat in principio, et nunc, et semper, et in saecula saeculorum. Amen. [Source: p. 172, from the 1910 Raccolta; 40 days indulgence, once a day, Pope Gregory XVI, August 21, 1837]. Help us, O God of our salvaion, and for the glory of Thy Name deliver us: be merciful to our sins for Thy Name's sake. Save me, O Lord, in Thy name; and judge me in Thy strength. For, behold, God is my helper, and the Lord is the protector of my soul. I will freely sacrifice unto Thee; and will give praise, O God, to Thy Name, because it is good. Gloria Patri et Filio et Spiritui Sancto, sicut erat in principio, et nunc, et semper, et in saecula saeculorum. Amen. Lord, we beseech Thee, in Thy pity hear the prayers of Thy people; that we who suffer justly for our sins may, for the glory of Thy name, mercifully be delivered. Through Christ our Lord. R. Amen. We beseech Thee, therefore, help Thy servants, whom Thou hast redeemed with Thy Precious Blood. [Source: p. 173, from the 1910 Raccolta; 100 Days T.Q., Pope Pius IX, November 8, 1849].